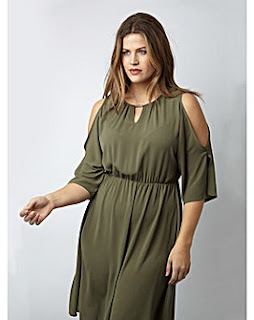 As a girl that is plus size, I always struggle to find clothes that suit, are cut well and fit properly. My go to's are usually River Island Plus or ASOS Curve and if they didn't suffice I'd be pretty stuck! I recently came across JD Williams..a website that I'll admit I've never even come across let alone looked at! However it doesn't just stock Plus Size or smaller, but a lot of sizes! Some products go up to a size 34. A particular category that took my eye is the Dresses category. I used to forever live in dresses, you couldn't keep me out of them! No matte the occasion, everyday, formal, casual, I would be I dress. The bigger I seemed to get, my confidence was shot to pieces and I used to hide in figure hugging jeans and tops, the baggier the better. I am currently on a Slimming World Weight Loss Journey, and so have I have lost 1 and a half stone. Don't get me wrong, I've got a long way to go...an AWFUL long way. However, it is the start of my little journey and my confidence is slowly creeping up. Anyways, I digress, back to the dresses! The one thing I did notice about JD Williams is that they do Coast...plus size coast at that and exclusive to JD Williams. They have some truly beautiful Coast Maxi dresses, that would be perfect for a Summer wedding reception and also some gorgeous midi, floral dresses that scream Summer. The Everly Dress in particular is such a steal priced at £74 with a saving of £95 on the retail price. 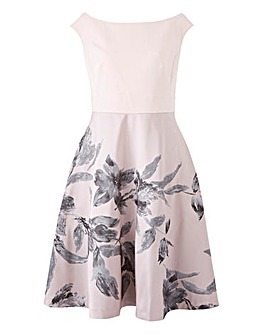 It is absolutely pretty as a picture with a gentle floral skirt and slightly off the shoulder number. I like! This Khaki Lovedrobe number has also caught my eye. I love the crepe material that seems to skim curves and flow beautifully as well as the open shoulder. Quite a steal at £32 too! There's also 20% at the checkout for new customers, who doesn't love a discount code?! I must admit the Beachwear Section has also caught my eye! Maybe a holiday purchase is in order!